Desert Tobacco is a member of the Nightshade or Potato Family. The plant grows to 3 feet in height and has dark green, sticky, oval to lance-shaped leaves which clasp the stem of the plant and grow to 6 inches in length. The plant typically grows in washes and sandy areas at elevations below 6000 feet. Desert Tobacco is poisonous and should not be eaten. The leaves of the plant contain nicotine and were smoked by Native Americans. 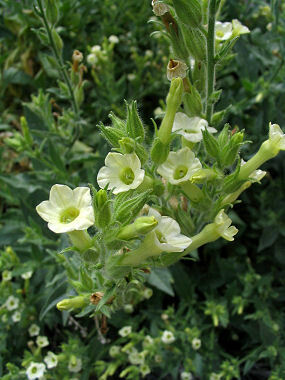 Desert Tobacco blooms throughout the year and produces white to greenish white, trumpet-shaped flowers to 0.75 inches in length which grow in loose clusters.